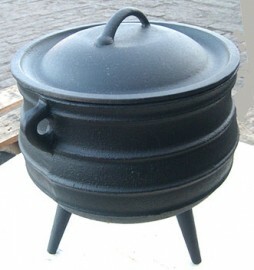 The Size 20 Potjie Pot includes well-fitted lid and carrying handle. Pre-seasoned with flaxseed oil and made from pure gray cast iron. Size 20s are used by unique restaurants and outdoor patio food service businesses and will feed very large groups and holds nearly 60 quarts. Height: 19.0" Width: 20.25" Capacity: 14.75 Gallon Weight: 105 lbs Requires Truck Shipping Contact us for shipping quote.